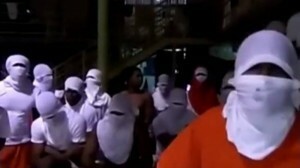 WILLEMSTAD – Guards at the SDKK prison in Curaçao used tear gas early this week to get detainees back into their cell again. About 35 prisoners rebelled because there was no food. They also complained about a lack of medication and poor medical care. To reinforce their anger, the 120 prisoners of block 7 made a film, which was later distributed on the internet. In it they complain about the spoiled food and demand a meeting with the minister. That did not happen. However, a delegation from the civil service union was admitted on Monday for consultation with the management. They said that a change in the purchase schedule temporarily caused problems in the supply. There would be no question of spoiled food. The situation in the former Bon Futuro prison remains tense. On Sunday it was uneasy after a drone had dropped drugs and cell phones over the prison. According to the management, this happens weekly, and the guards have their hands full. Justice Minister Quincy Girigorie said at the beginning of this week in parliament that the budget for the prison is under pressure. The change in the purchasing schedule for food has everything to do with this. There is also less money available per prisoner. The medical care and the supply of medicines are falling short because of a lack of money.